When you see the alluring scream queen Tiffany Shepis’ name in the credits of Image Entertainment’s newly announced horror film from writer/director B.C. Furtney you can’t help but sit up and take notice. 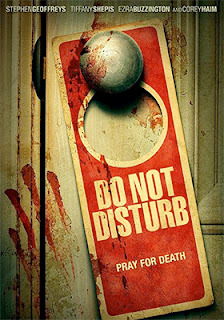 The film is Do Not Disturb and it is headed to DVD on Aug. 6. That was the “calling card” that got our initial attention and then we realized that this was the missing in action New Terminal Hotel that was promised back in 2010 and may or may not have actually been released on DVD (perhaps a rogue/bootleg DVD-R product offering that quickly disappeared from sight). The backstory of the film’s checkerboard history might be fascinating, but time limitations prevent a trip down that path at this moment in time. No matter, it is good to see that this film will finally be getting a proper release … Aug. 6 can’t come soon enough. With that said, what makes this film important — especially for genre fans — is that Do Not Disturb (aka: New Terminal Hotel) not only showcases the talents of Shepis, but this is Corey Haim’s final screen appearance. But wait, there’s more, the lead is none other than Fright Night’s Evil Ed, Stephen Geoffreys, who plays a Hollywood screenwriter who has gone over the edge … in a big way. The set-up goes pretty much like this, Don Malek (Stephen Geoffreys) is a screenwriter and Ava (Shepis) is his agent, who sticks with him despite some obvious issues that Malek is dealing with. As it turns out his fiancée (played by Laura Hofrichter) has met an untimely end — the killer appears to have gotten away with it — and he has become obsessed with revenging her death … and why not write about the process of that revenge! With an increasingly unhinged Malek at work and his agent moving him along (a little unhinged herself as the film progresses), Do Not Disturb quickly descends into a bloody rampage which genre fans will take great pleasure in. It is not just a kill-spree film as Furtney has embedded some well-observed “Hollywood” lifestyle machinations into his script. Indeed, anyone who has walked the streets of Hollywood (north of Santa Monica Blvd and south of the freeway) knows that strangeness — and strange people — can be the order of the day. Clearly filmmaker B.C. Furtney knows his Hollywood and has written in some choice characters — in addition to Geoffreys and Shepis — and that includes Ezra Buzzington (The Hills Have Eyes, The Prestige, Secretary, etc.) as Malek’s neighbor Spitz, who is so strange that even Malek cringes at his peculiar predilections. Which gets us back to the aforementioned well-observed “Hollywood” lifestyle machinations … so true; so Hollywood. 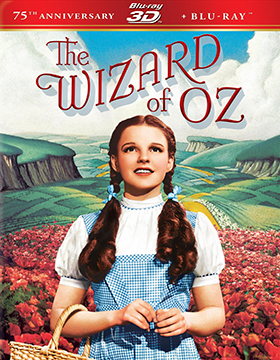 Warner Home Video is off to see the Wizard on Oct. 1 with a 75th Anniversary celebration. On that date The Wizard of Oz will be lighting candles on the birthday cake that features a four-SKU product offering, including the debut of a Blu-ray 3D edition of the film (an IMAX 3D theatrical launch is also planned for Sept. 20). This newly remastered version of the film has been converted to 3D for the double set of The Wizard of Oz: 75th Anniversary Edition 3D/2D SKU — which will also be included as part of the The Wizard of Oz 75th Anniversary Collector’s Edition (a five disc affair featuring UltraViolet and both 3D and 2D versions of this classic, plus a boatload of collectible items). Also counted in the SKU mix are both stand-alone single-disc Blu-ray and DVD editions. As to bonus goodies, there is an all-new documentary titled The Making of the Wonderful Wizard of Oz (included on all editions of the release), plus all of the bonus nuggets from the previous Blu-ray rollout in 2009 will be included on the Blu-ray editions. Plus, Oct. 1 will also mark the Blu-ray debut of one of the greatest silent films of the period, director King Vidor’s 1925 World War I masterpiece, The Big Parade. For those unfamiliar with the film, the last 30 minutes ranks right up there with the most riveting film sequences ever to grace the silver screen. 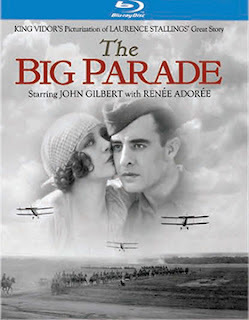 Included in this DigiBook SKU is a 64-page booklet prepared by historian Kevin Brownlow, plus there is commentary from film historian Jeffrey Vance, a 1925 silent short film (a tour of the MGM studio) and the documentary titled “The Men Who Made the Movies: King Vidor”. It has been pointed out that the CJ Entertainment Aug. 13 DVD debut of writer/director Jo Sung-hee’s A Werewolf Boy is not necessarily to be approached from an American POV, but rather one should consider the story from a distinctly Korean outlook. Fair enough — either one works in the end. From the American cinema understanding, this is a werewolf film with a twist; a romantic twist. It is ultimately a sad, bittersweet film that has its moments of horror, but then so did The Hunchback of Notre Dame, which is closer to being its cinematic cousin, then, say, The Howling. Told in flashback, which sets the film in the aftermath of the Korean War, a beautiful teenage girl named Suni (Park Bo-young — Don’t Click) has been moved from Seoul to the countryside for health issues. It is here, during her recovery, that Chul-soo (Song Joon-ki — Penny Pinchers, Heart is ... 2, etc.) comes into her life. He is seemingly a wandering orphan boy uprooted by the war. The kid is mute and very strange, which we assume — at first — to be the result of the horrors of war and a survival instinct that has reduced him to an animal-like state. It is her kindness and dedication to him that leads to a fondness and loyalty that could develop into a full-blown romance as the two grow up. But we know from the early set-up that something happens to prevent this … it is unresolved in the past. 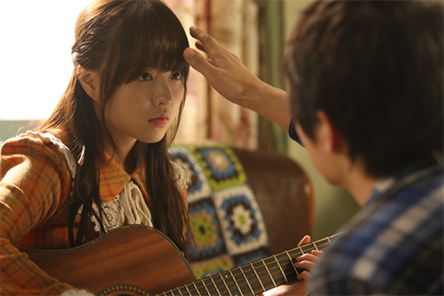 From a Korean sensibility A Werewolf Boy is a tale of unrequited love; a love that can never be fulfilled. The fact that Chul-soo has some issues (military experiments gone awry) is quite beside the point. There is this subtle difference. In American cinema this horror story would have its linear trappings — set-up, development and resolution. In the Korean sense, it is more lyrical, with Suni sacrificing the “resolution” — and potential happiness — for the sake of Chul-soo. The “happily ever-after” timeline is not relevant. 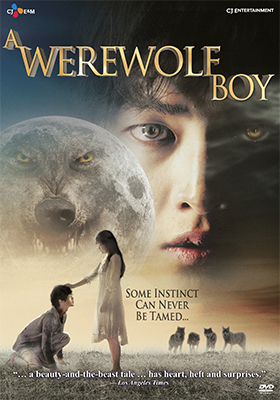 This may seem confusing, but A Werewolf Boy is not a film to be easily pigeonholed. It is part-fairy tale, part-love story and part-social commentary, wrapped with horror trappings. As to bonus features, CJ Entertainment has included three featurettes and deleted scenes (with commentary). The film is presented in Korean with optional English subtitles. 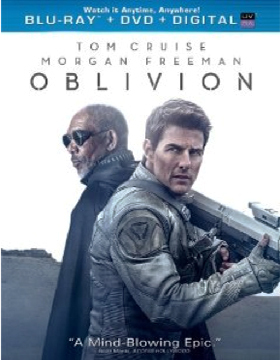 July 23 is the street date for Universal Studios Home Entertainment’s DVD and Blu-ray/DVD Combo Pack (with UltraViolet) product offerings of director Joseph Kosinski sci-fi thriller, Oblivion. Tom Cruise and Olga Kurylenko are teamed as survivors (with a past) on a devastated Earth — the result of an all-out war with an invading alien species some 60 years earlier. The ARR is 109 days and the box office take was a solid $88.5 million.